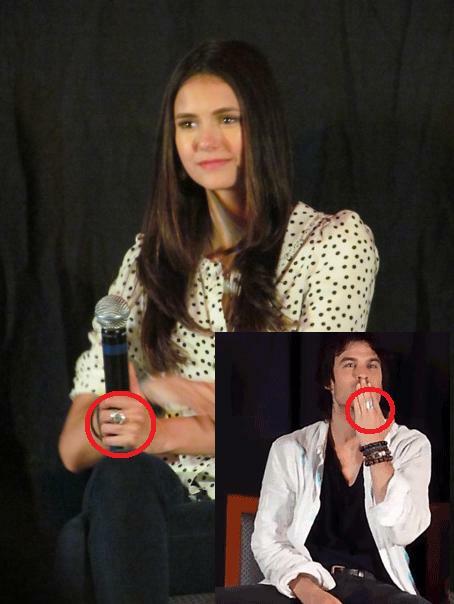 Ian/Nina wearing similar rings on the same finger of the same hand ! ♥. . Wallpaper and background images in the Ian Somerhalder and Nina Dobrev club tagged: nina dobrev ian somerhalder nian the vampire diaries. This Ian Somerhalder and Nina Dobrev fan art might contain well dressed person, suit, pants suit, pantsuit, outerwear, overclothes, coffee break, and tea break.